'phoenix I' is made from air-dried, solid Irish birch sourced from a local sawmill in Co. Wicklow. 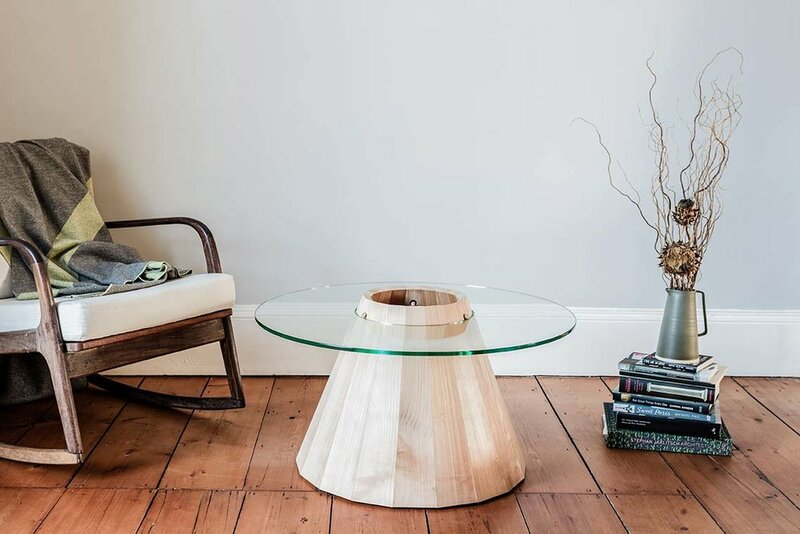 The design is inspired by the craft of barrel making with the base being made from 18 staves and the circular top acting as the hoop that locks the staves together. This design accommodates any natural shrinkage that may occur in the air-dried staves. The table comes flat-packed and no screws or glue are used in the table's assembly. Three wooden bungs are used to locate and fix the top. Each of the staves are hand planed to give a natural sheen / finish. Typically this finish is left natural, although a hand rubbed oil finish is also possible. Dimensions: diameter 82cm, height 45cm.